Title: Challenges for deep neural network models of visual cognition: from incorporating biological constraints to predicting correlational and causal experimental outcomes. Deep convolutional neural networks (DCNNs) have revolutionized the modeling of visual systems. However, despite being good starting points, they do not fully explain brain representations and are not like a brain in many ways. DCNNs differ from the brain with respect to their anatomy, task optimization, learning rules etc. For instance, most DCNNs lack recurrent connections, are supervised learners, and do not have brain-like topography. Therefore, the next generation of models could benefit by incorporating the critical brain-inspired constraints. On the other hand, the model predictions need to be experimentally validated. A common trend is that experimental data collection and modeling are executed somewhat independently, resulting in very little model falsification, and thus — no measurable progress. Our main proposal is that the synergy and collaboration between computational modeling and experiments is critical to achieve success. The approach needs to be a closed loop; models predict experimental outcomes — experimental outcomes falsify models — better models with further experimentally derived constraints are built. We aim to list and discuss the challenges we face and the path forward in establishing this closed loop to solve visual cognition. We are finally at a stage in visual neuroscience, where computational models have progressed beyond toy-data descriptors to real predictive models simulating the one running in our brains. We need to capitalize on this success and start asking the hard questions demanding more stringent empirical tests to falsify current models and build better ones. This workshop sets the stage for both senior and early-career researchers to engage in a very objective discussion on what should be the next steps. The diverse group of invited speakers with varied scientific approaches will ensure challenging and interesting discussions. Targeted participants: Neuroscientists working with different animal/computational vision models. I recently came across the website of this company Spritz. They claim to have found a way to scientifically fasten your reading speed. Here’s how it works. First, they identify the Optimal recognition point (ORP) of a word. Then they highlight that letter with red color (rest of the letters being black). As a reader you fixate around the ORP and they show each word in a text at a certain speed. No macro eye movements are required. So that saves you from the fatigue. And if you keep at it for a while, your reading speed evidently increases. You can go from 130 words/minute to 250 words/minute pretty quickly. In fact, they also pause and introduce gaps at punctuation. I have tried it and it seems to work. It is best for reading books (without images) and news articles. Here’s a snapshot of the app. (iTunes Link; free download, but you have to pay 4$ to really reap its benefits). 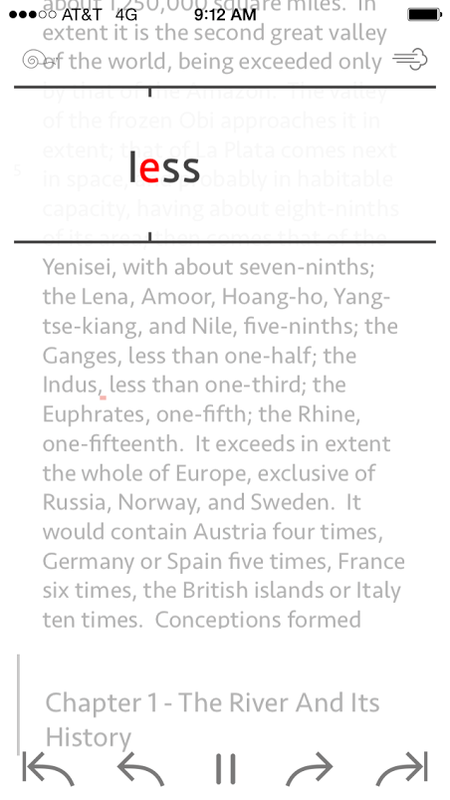 In the screen-shot, you can see the ORP in red, the main text (blurred, in the bottom). Each word is shown one by one. 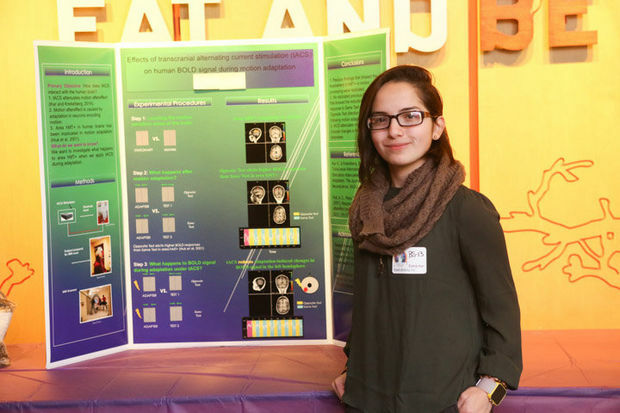 I am delighted to share the news that Melanie Arroyave (Bayonne High School), who worked with me for a couple of months last summer (on concurrent transcranial electrical stimulation and fMRI) from the Partner in Science Program ( http://lsc.org/for-educators/programs-at-the-center/partners-in-science/ ), won the gold medal at the 57th annual Hudson County Science Fair. She presented the work that she did with me here at Rutgers. Congrats Melanie! Click here for the link to the news article on the Jersey Journal. She is super excited, and wants to come back for this summer too and work in our lab (Krekelberg Lab)! It makes me happy because she is one of the youngest minds we have stimulated and that too without putting any electrodes on it! Finally the day has come and gone ..
1. My parents can now watch it from India. 2. If you are a dear friend and missed it, here’s your chance to watch it. 3. Future recruiters, who might wanna check me out can do so, without me knowing or having to travel to their home ground to defend myself. This summer I got to interact with and mentor two very nice and smart high school students for the partners in science program. They are not even juniors but they really worked hard and grasped most of the key concepts of my PhD thesis. We worked together to analyse some fMRI data on a very recent (unpublished) experiment. I am putting their presentation video here. Mentoring them has been one great learning opportunity for me too. It has been ultimately a very satisfying experience. I would very much encourage any grad student to try and do this if possible. Not only it is a rewarding experience for us, it is also a great way to make kids interested in real science. Occasionally, I was also reminded how simple questions asked by the students can make you think harder than ever and make you realize that basics are so important. 1. Decide if you wanna catch the fly or count the hairs on its legs (#Pascal). 5. Knowing the right person at the right time is not luck but a result of multiple factors (having real interest in science, publishing papers, attending these kind of summer courses, being genuinely interested in learning from other’s work etc) that maximizes the likelihood of the event! Day 4 started off with Geoff’s 2nd lecture on fMRI. After briefly recapitulating the properties of a linear system, he spoke about the use of general linear models in fMRI analysis. He mentioned about ‘m-sequences’. At the end of his talk, Geoff told us that he thinks that vision neuroscientists have been completely focused on peripheral vision and that should change. The afternoon session was taught by Stephanie. 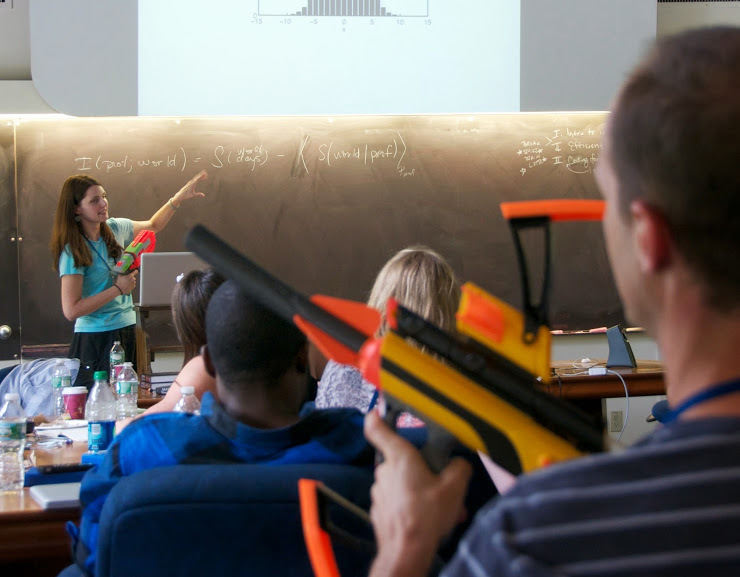 This is the first time when the weaponry (nerf guns) were officially employed 🙂 Infact, Stephanie herself asked us to shoot if we didn’t understand any concept or if she went too fast. Although since Jonathan invited her, she gave us the option to shoot at Jonathan instead as well! The pic below summarizes it all…. Stephanie talked about information theory. In the break time we played “the spike lottery” (I will explain it some other day).